The Vault Beta is Live! If you want to see the new API features or get a head-start updating your code, you can sign up for the Vault Beta. The Beta features a full SDK, including documentation, samples and utilities. There are some nice new API features that I am excited about. I can't go into any specifics on this blog, but I'll be active in the Beta forums answering questions and listening to feedback. If you haven't been to the Vault Wiki recently, you might want to have another look. It's recently been upgraded. The layout is more intuitive, the search engine is much improved, and there are videos for those of you that are blocked from YouTube. You may also want to check out the properties white paper, which explains how properties work at the product level. It's a nice complement to my articles which explain properties at an API level. I want to explain some of the more confusing aspects of File attachments and dependencies. It's just what it sounds like. The parent file depends on the child file. The parent file can't work properly if the child file is not present. Dependencies should be only created programmatically such as the CAD client or a custom program. It a parent/child link where the parent does not depend on the child file. 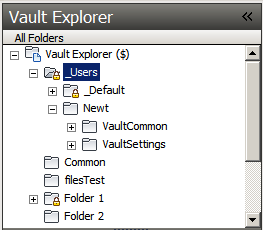 This is the only association type that the end user can explicitly create in the Vault Explorer client. Sometimes it's unclear what type to use. I recommend asking yourself this question "When viewing the parent file, do I always want the child file to be present?" If the answer is yes, then it's a dependency. If the answer is no, then it's probably an attachment. How do dependencies affect behavior? A lot more business logic is built into dependencies. Operations that will break a file reference are restricted. For example, you can't delete a file that has a parent dependency. However, you are allowed to do the delete if you are deleting all the parents too. The move and rename operations in Vault Explorer have special client-side logic for updating parent references during these operations. If the parent can't be updated, the operation is blocked. However this is all client-side logic. The server will allow moves and renames in these cases. So it's up to the client application to insure that file references don't get broken when the API calls are made. What is a Design Visualization attachment? This is a case where a parent is attached to a child file with the DesignVisualization classification. In other words, the child is meant to provide a view for the CAD data. The nice thing about this attachment type is that you can create them without increasing the version of the file. The server will allow you to have design visualizations of any type, however many clients will only recognize DWF files. It's also a good idea to avoid having more than one visualization attachment on a single file. What does a "source" mean? When you add or check-in a file, you set up your attachments and dependencies. You pass in the File ID of the child file and you have to provide a "source" for the association. A source is basically the application that "owns" the link. Other applications are supposed to refrain from modifying the link. A null value means that the link is not specific to an application. The source concept was introduced specifically for the Inventor DWG feature, and I am not aware of any other uses. Basically, it tells if an association is owned by Inventor or AutoCAD so that one app doesn't alter the other app's associations. The only legal values for a source are null, "INVENTOR" and "AUTOCAD". Any other value may lead to strange behavior in some clients (the server doesn't care). The recommendation is to pass in null for new associations. If you are preserving an existing association, just pass in the existing source. Inventor and AutoCAD files should be added to Vault via through the CAD applications themselves. Wouldn't it be nice to push Vault settings out to all the Vault users? Saved searches, for example. Or maybe a plug-in from your favorite Vault API blog. If there was only some sort of centralized document repository that you could use to deploy these files from. Welcome to Project Thunderdome, my attempt to make local Vault settings into global Vault settings. Let's start with the Users Folder concept, which Thunderdome sets up. It works the same as with Windows, each user can get their own folder that only they have access to. There is also a Default Folder which all users can read from. The Administrator can place data in the Default Folder to have it pushed out to everyone with Project Thunderdome installed. This can be used to push out just about any client setting (saved searches, grid state, shortcuts, etc) and other Vault Explorer extensions (Watch Folder, Set Revision iProperties, etc). 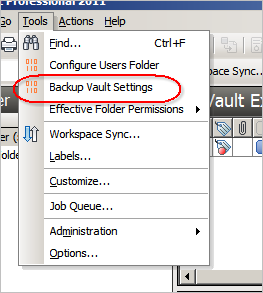 And just for fun, I added a command that will let a user back up their Vault settings to their user folder in Vault. I can see a bunch of uses for the "Users Folder" concept. I'm sure I will re-visit it in future sample apps. You're also free to expand upon the concept however you see fit. Let me know what you think. I'd like to take a moment to talk about the Information Service and why it is unique. You see, this is the only service compatible across multiple releases. All other services are locked to a specific Vault release. For example, a Document Service that talks to a Vault 2010 server will fail if you try to connect it to a Vault 2009 or Vault 2011 server. But not the Information service. Starting with R5, all Information service functions have been compatible with the future release. No need to re-compile or update the web reference. The reason it works that way is because this service tells you the version of the Vault server. Locking it to a specific version would have been self-defeating. The main idea is that you can check with the Information service before you sign in. If the server version doesn't match the version you expect, you abort the operation because you know that the sign in won't connect properly. Not only can you get the version of the server, but you can tell which Vault product is running on the server. GetSystemProducts() is the main function in the server. The other functions are there for rare cases and backward compatibility, so you will probably not need to deal with them. GetSystemProducts has some interesting behavior. First, you get an array back, not a single value. This array will contain the server product and all subset products. So, a Vault Professional server will return 4 Products: Vault Professional, Vault Collaboration, Vault Workgroup, and Vault. A base Vault server will just return the Vault object. The ProductName value on the Product object is tricky. Because of backward compatibility, this value resembles the original product name, which may not be the current product name. You probably know that Productstream was the original name of Vault Professional, but did you know that Vault Professional was the codename for Vault Workgroup? Lastly, there is the ProductVersion value. This is a string with a 4 part version number corresponding to the build number of the Vault server. For example "1.0.3.200". For some strange reason, Vault uses Inventor's primary build number. So even though Vault 2011 is technically R9, it has a primary build number of "15". Anyway, the primary number is the only one you need to worry about. The second build number is the service pack level, but the API does not change during service packs. And the last two numbers are just increment values. All the Product objects returned should have the same build number. In the past, it has always been the same, and I don't see that ever changing. The effort to test and support a mixed version server would be astronomical.